The Cariboo Regional District spans the Cities and Districts of Quesnel, Williams Lake, 100 Mile House, and Wells in the Central Interior of British Columbia. The Canada 2006 Census population was 62,190 persons living on a land area of 80,629.34 km² (31,129.9 sq mi). It covers the area from 70 Mile House to Hixon, just south of Prince George. Twelve electoral area directors and four municipal directors govern the affairs of the Cariboo Regional District. The electoral area directors are elected by area voters, and municipal directors are appointed by their municipal council. All directors serve for a four-year term. The Cariboo Regional District provides region-wide library services, recreational facilities, and local fire protection. The Cariboo District and 100 Mile House are featured prominently in Al Purdy's poem "The Cariboo Horses" to examine the tradition of equinity against human civilization. Regional District Electoral Areas are A, B, C, D, E, F, G, H, I, J, K and L.
Cariboo A (Red Bluff-Quesnel South) is a regional district electoral area (RDEA) in the Cariboo Regional District, British Columbia, Canada. The electoral area is located along the east side of the Fraser River south of Quesnel and west of the Quesnel River. 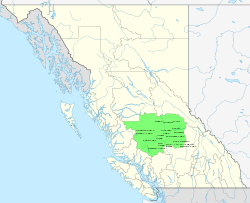 The area represented is also referred to as the North Cariboo, but that term also includes the City of Quesnel, and the many Indian Reserves within its boundaries are not part of the system of regional district governance and are outside the regional district's jurisdiction. Electoral areas have no administrative or governmental significance; they are used only to elect rural representatives to regional district boards. ^ Christopher Wang, "Only Horses: Adventures in Time and Space." Accessed 18.05.2014. This page was last modified on 5 September 2015, at 15:28.